The music of the era was part news, part Gospel, all life and especially the hard times. The music was a reflection of what life was like in the region with coal mining, poverty, lack of modern accommodations, the injustices and the culture of that part of the country. Much like today which is a modern day image of the past. The songs told of life and strife. They most certainly also had memories of the Civil War just a few decades earlier. "Johnny Cash once said that the Bristol Sessions are the single most important event in the history of country music," said Birthplace of Country Music Alliance Board President John Rainero. "It's amazing that those recordings are still having an impact, even today." Bear Family Records packaged the original Bristol Sessions in a boxed set of five CDs, a wonderful book with photos and history. This collectors set captured the event of 87 years ago and made it available once again. This music captured the famed Carter Family as well as others known throughout the region such as Jimmie Rodgers, Ernest V. Stoneman and others of the Stoneman family, the Johnson Brothers, Uncle Eck Dunford, Blind Alfred Reed, Alfred G. Karnes, Tennessee Mountaineers, Tenneva Ramblers and more. Then, in September of last year, East Tennessee State University and the Birthplace of Country Music presented the release of Johnson City Sessions 1928-1929 - Can You Sing or Play Old-Time Music? CD Box Set, also remastered by Bear Family Records. While Johnson City is less than 25 miles from Bristol, this collection offered even more of the mountain string music from East Tennessee. Captured for eternity were the Roane County Ramblers, Clarence Green & Wise Brothers, Shell Creek Quartet, the Bowman Sisters, Greensboro Boys Quartet, McCartt Brothers & Patterson, Jack Jackson, George Roark and many many more. The two collections are a historical element of themselves. They captured the music that lived in the mountains and hollows of the Appalachia region around East Tennessee. They captured a sound that was foreign to much of the country and the country was thirsty for it. That sound was the foundation of today's Country Music. While today's Country shares little with those early recordings, there is no denying that Country and Bluegrass Music had the "Sessions" as their roots. Those roots ran deep. Today, we find many of the most well known names of modern country music are from the region. Kingsport, Johnson City, Bristol, and other Tennessee towns spawned a large number of popular artists. Western Virginia was no different with Hiltons, McClure, Abingdon, Galax and others brought out legends like Dr. Ralph Stanley and the Clinch Mountain Boys, the Carter Family and more. Now, a new project is on the horizon. Orthophonic Joy: The 1927 Bristol Sessions Revisited, the third piece of the new popularity of "The Bristol Sessions." Orthophonic Joy is being orchestrated and produced by multi-Grammy award winner Carl Jackson and is planned for an October release. The project will also be highlighted as part of the Birthplace of Country Music Museum's grand opening in August. This Smithsonian Institution-affiliated Birthplace of Country Music Museum is dedicated to preserving the legacy of the 1927 Bristol Sessions and their lasting influence on American popular music. These legendary recordings by Ralph Peer took country music to a new level and produced pioneers of the genre, such as Jimmie Rodgers and the Carter Family. Orthophonic Joy features entertainment legend Dolly Parton, Doyle Lawson, The Chuck Wagon Gang, as well as country music stars Vince Gill, Emmylou Harris, Marty Stuart, Steve Martin and the Steep Canyon Rangers, Ashley Monroe and others. 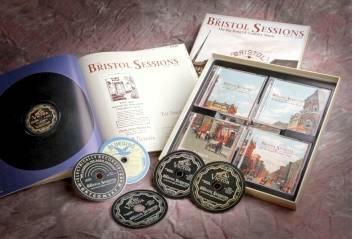 The recording project includes 16 of the original songs from the Bristol Sessions. The idea to recreate the Bristol Sessions had been discussed within the Birthplace of Country Music organization for years, but the serendipitous connection between board member John Rainero, veteran songwriter Rusty Morrell and producer Carl Jackson helped bring Orthophonic Joy: The 1927 Bristol Sessions Revisited to life. In the spirit of Ralph Peer, Jackson and the Birthplace of Country Music organization have launched a nationwide search for a new artist to record the final track on the album. Emerging and independent artists were encouraged to submit one of the following selected Bristol Sessions songs: “The Storms Are On the Ocean,” “Darling Cora,” “Bury Me Under the Weeping Willow,” or “I Am Bound For The Promised Land.” Deadline to receive submissions is July 10. Four artists will be selected for Jackson and a panel of judges to review. For a complete list of contest rules, visit www.BirthplaceofCountryMusic.org. There is no denying the impact that Ralph Peer had with his recordings. An entire genre of music, world wide, was spawned and continues to grow. In addition to Country Music, Bluegrass, Old-Time and modern string bands have also evolved and prospered through the sound captured on those 78 RPM discs. The new recognition of the "Sessions" and their importance in the history of the music is welcome. While many sounds disappear into obscurity, the sounds of the Big Bang are still very much alive. August 1st will be a great day as the Birthplace of Country Music Museum opens. The museum honors that day in the summer of 1927 when Ralph Peer, a producer for the Victor Talking Machine Company in Camden, New Jersey, saw Bristol’s potential as a hub for country music and decided to hold auditions. It was a decision that would make history and change America's music landscape forever. The museum will tell this story of our musical heritage through exhibits, performances, galleries, music mixing stations, theater and high-tech multi-media.